Australis cruise itineraries sail and more extensive than return to the same port of Punta Arenas the itineraries are round trip. Darwin's Route from Punta Arenas: The end of the world awaits you on the expedition cruise ship MV Stella Australis. Our Punta Arenas and Patagonia excursions retrace much of Darwin’s route through the Fuegian Archipelago aboard HMS Beagle. 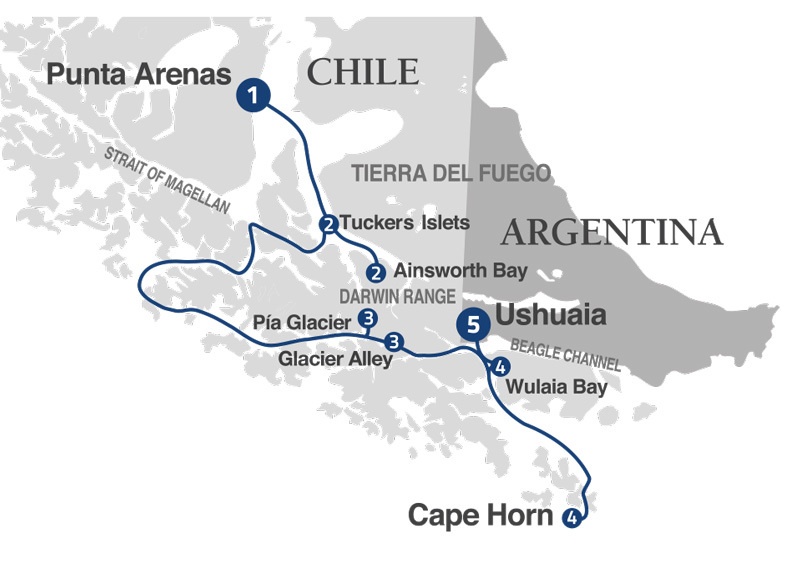 This eight-day Punta Arenas excursion features the legendary Cape Horn, historic Wulaia Bay, spectacular Glacier Alley, and the penguins of Magdalena Island and Tuckers islands, as well as ice fields, fjords, sub-polar forests and secluded beaches at the southernmost extreme of South America. By the afternoon, we will make the check in at Punta Arenas, so then we can embark in one of the ships of Australis Cruises: Mare, Via or Stella. The city of Punta Arenas is also considered as "the capital of the Chilean Patagonia", it is also famous because of its port in the south limit of Chile and point of South America. In the morning we will disembark in the City of the End of the World, Ushuaia. During our visit to this city we cannot miss the famous "Presidio de Reincidentes". we will also visit the natural charm of the National Park Tierra del Fuego and its beautiful lakes. The national park is a strict Natural Reserve, which was home of the natives Yámanas in the past, where we will able to find several archaelogical sites that belonged to this Group.